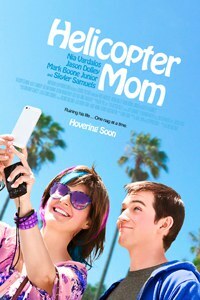 Any potentially forward-thinking ideas Helicopter Mom has are drowned out in the labels the film puts on itself. Maggie Cooper (Nia Vardalos) thinks she's a hip mom. She wears pink and blue streaks in her hair, talks casually about weed, and is way more excited for her son Lloyd’s (Jason Dolley) 17th birthday than he is. Yet she's also less than cool, as indicated by the title of the movie in which she appears, Helicopter Mom. It opens as Maggie and Lloyd are making their way around Venice Beach. We see what she sees, slim surfers and skaters with their boards, tourists with their maps and cameras, a pack of bikers in black leather, their faces menacing. Now we know: Maggie isn't the only stereotype in Helicopter Mom. Salome Breziner's comedy follows the well-intentioned but overbearing Maggie, doing her best to look after Lloyd and also, maybe, to let him go. A sensitive writer of poetry, Lloyd is as different as possible from her and also his mostly absent, ex-hippie dad Max (Mark Boone Junior). He doesn't feel as though he fits in at high school, where the crowds of Venice Beach surfers and tourists are replaced by cheerleaders and band geeks. Maggie thinks she knows why: when she submits a college application on his behalf, she applies as well for a National Out Gay Student Scholarship. Lloyd is less certain of his orientation than his mother and is and horrified to be outed when his high school classmates hear about the application. Maggie doesn't stop here: she takes it upon herself to get Lloyd elected for prom court and sets him up with various male suitors. No surprise: Lloyd becomes increasingly aggravated at his mother’s meddling while he tries to figure who he is. Maggie (who too frequently recalls Vardalos' past roles) can't seem to help herself. When she presses Max to ask Lloyd about his personal life, an exasperated Lloyd replies, “I hate everybody trying to put a label on me.” Unfortunately for Lloyd -- and the rest of us -- Helicopter Mom does just that through its reliance on clichés, at times seeming as overbearing as Maggie. If its stereotypes are played for cheap laughs, they also tend to minimize Lloyd's story, his struggle with his sexual identity. One of these stereotypes is Barbara (Gillian Vigman), president of the PTA. As she stands at a podium, blonde hair pristine and red lipstick flawless, her imperious attitude is underlined by a low angle shot, so you know she's looking down at Maggie and us too. The reverse shot of Maggie shows her considerable effort to be pleasant as Barbara and her minions suggest that Lloyd should start his own club where they could do “needlepoint” and “choreography”. Even as Barbara is an easy target for the film, Maggie is also prone to imposing her own backwards thinking on her son. She shares her enthusiasm with a friend, Norma (Kate Flannery), imagining, “My gay son and me going purse shopping: how great would that be? !” That Norma is equally egregiously misinformed ("My son’s not gay: he doesn’t like pesto”) doesn't make Maggie look any better. Such antics are occasionally relieved by less cartoonish relationships. Max and Lloyd share a more one evening near the high school, following Lloyd's date with a boy Maggie has set up. It’s dark, and the two are illuminated only by occasional streetlights. In contrast to the opening scene, so in love with the hustle and bustle of a crowded tourist trap, the setting here is nearly silent, save for the chirping of crickets. “You’re a much better person than I was in high school,” Max says. “You’re more thoughtful, and more mature.” Lloyd and his dad converse like adults, not types. Lloyd's maturity is also on display with Carrie (Skylar Samuels), Barbara’s daughter. At first glance, we might mistake her for a standard movie-style cheerleader, privileged and arrogant. But as she and Lloyd discuss the coming prom, and especially that each might be going stag, the scene again is quiet, the conversation one we might imagine kids having. As Carrie laments that she hates people assuming she’s going to prom with the quarterback, the sunlight behind her is lovely, not overstated. Such quietly affecting moments are too rare in Helicopter Mom. On its surface, it's a new take on the coming-of-age-film, where Maggie's growing up is as much the focus as Lloyd's, but the movie's potential forward thinking is overwhelmed by the labels it puts on itself.